Photo: (From Left, Clockwise): Via Trip Trotting, Via Pasadena Chalk Festival, Via Long Beach Antique Market, Via The Ultimate Mount Hollywood Motivation Hike. Ever hear the phrase "adventure may hurt you, but monotony will kill you"? We think it's a good philosophy, especially when faced with the temptation to fall into a comfortable (read: boring!) routine. This week, we're helping you mix it up with our list of 5 exciting things to do in LA. From a nationally renowned film festival to an art-filled one, we can bet you'll feel newly energized. In this company town, film reigns supreme (we also have a serious argument for fashion, though! ), which means Angelenos reap the benefits of having Hollywood in their backyards. One such perk is the Los Angeles Film Festival, kicking off this week. Movie-buff heaven, no doubt, this flick fest includes screenings of both international and American films, convos with top moviemakers, music at the Grammy Museum, and a slew of other happenings. Our girl Maya Rudolph is even sharing pointers on how to score a laugh! Whether you’re splurging on a full-access pass or opting for single events, it’ll be a great time for movie lovers and industry execs alike. Check out the full film guide and learn more here. Where: L.A. Live, 800 West Olympic Boulevard (at South Figueroa Street); 866-345-6337. 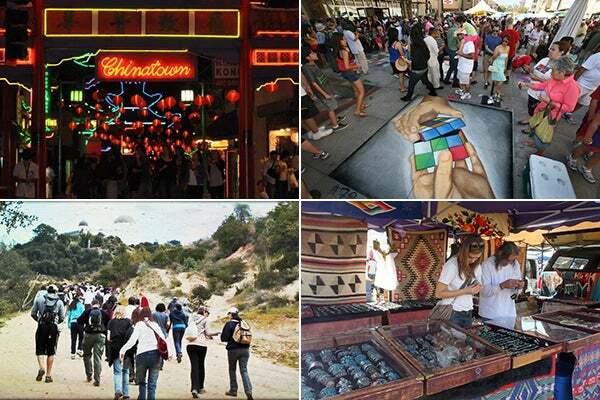 Chinatown might not be where you usually wind up on a Saturday evening, but this block party is the perfect chance to discover a real gem in the City of Angels. At Chinatown Summer Nights you can savor dishes from local restos and food trucks, shop local artists’ wares, jam to some sweet bands, watch chef demonstrations, hang at the Eagle Rock Brewery beer garden, and play a little ping pong, to boot. If you can’t make it this Saturday, don’t fret, the event is also going down on two separate, future dates: July 20 and August 17. Where: 943 North Broadway (near West College Street); 213-680-0243. Thinking about hitting Runyon this weekend? You might want to switch things up by doing The Ultimate Mount Hollywood Motivation Hike, where you can get your sweat on with more than 50 fellow Angelenos to the top. Once you're there? Well, that's where motivational speaker Bennie Mayberry and musician Daveon Overton will inspire and pump you up even further. Nosh on a yummy Café Gratitude quinoa and kale salad and sip a refreshing Jamba Juice smoothie as you take in incredible views of the city. We’re already digging the good vibes. When: Saturday, June 15, 8 a.m.
Where: 2650 North Vermont Canyon Road (near Los Feliz Boulevard); 323-522-5014. Coco Chanel had her sewing machine, Van Gogh had his paintbrush, and 600+ artists will have their chalk, next weekend in Pasadena. Rest assured, this ain't sidewalk scribbling — prepare to be amazed at what these amazing artists will create using the concrete as their canvas with over 100,000 onlookers. The Pasadena Chalk Festival is the largest street painting event in the world and will also feature live music, shopping, food, a children's craft area, and a classic car show, so bring the whole fam! When: Saturday, June 15 and Sunday, June 16, 10 a.m. to 7 p.m.
Where: Paseo Colorodo Pasadena, 280 East Colorado Boulevard (near North Garfield Avenue); 626-795-9100. If you're a die-hard vintage junkie, you know what the third Sunday of every month means. Yup, that would be the Long Beach Antique Market. With over 800 vendors offering collectibles, vintage clothes and accessories, home decor, and more — all at why-even-haggle bargain prices — there's no way you'll leave empty-handed. When: Sunday, June 16, 6:30 a.m. to 2 p.m.
Where: Long Beach Veterans Stadium, 4901 East Conant Street (near Clark Avenue); 323-655-5703.